This week’s news stories revolved around the one-year anniversary of the Parkland shooting, with a sprinkling of lighthearted videos and photos that went viral — kissing dolphins, a very “Florida” maternity shoot, and a bobcat chasing a squirrel … on top of a screened-in patio. South Florida Sun Sentinel climbed its way to the #1 spot on Twitter this week, beating out reigning champ, WSVN 7 News, with nearly four times as many social interactions. 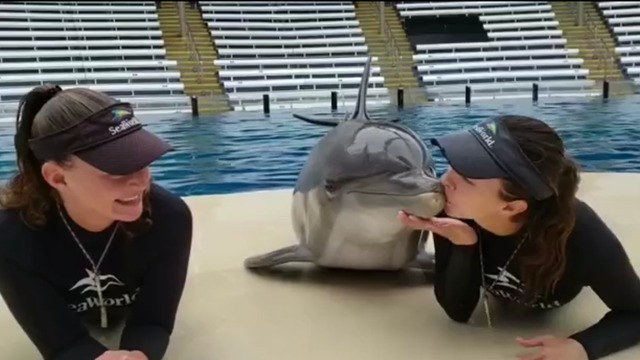 SeaWorld dolphin shows his trainers some love … and it’s ADORABLE! Florida commemorates the one-year anniversary of the Parkland shooting. Florida rapper YNW Melly is charged with killing two of his close friends. Florida communities come together to remember the 17 lives lost in the Parkland tragedy that took place one year ago. Honey, we’re having a … gator! This is the most “Florida” maternity shoot we’ve ever seen. Data was collected from CrowdTangle on Friday, February 15, 2019. It covers the period between Saturday, February 9, and February 15, 2019.